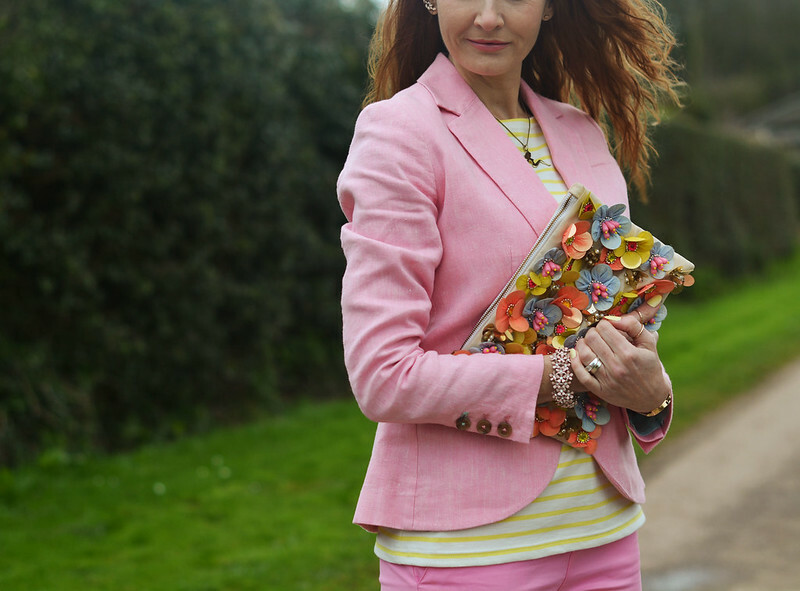 As promised in my last outfit post, I’m bringing you more brights and pastels for spring – and this could take the prize for brightest outfit on the blog ever. 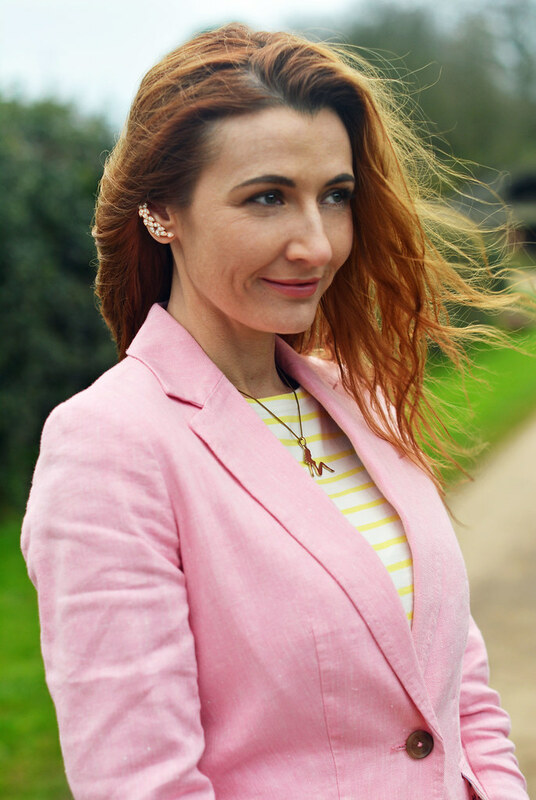 The kind people at Joules sent me a full springtime outfit, and I went full-force with pink and yellow and wore this on Good Friday when we had our family Easter get-together (the only day we were all free to gather at my parents’ house). It was also the husband’s birthday so I thought it only fair I dress up for the occasion. The weather (unlike the last few days in the UK) may not have been warm and sunny but this outfit more than made up for it! 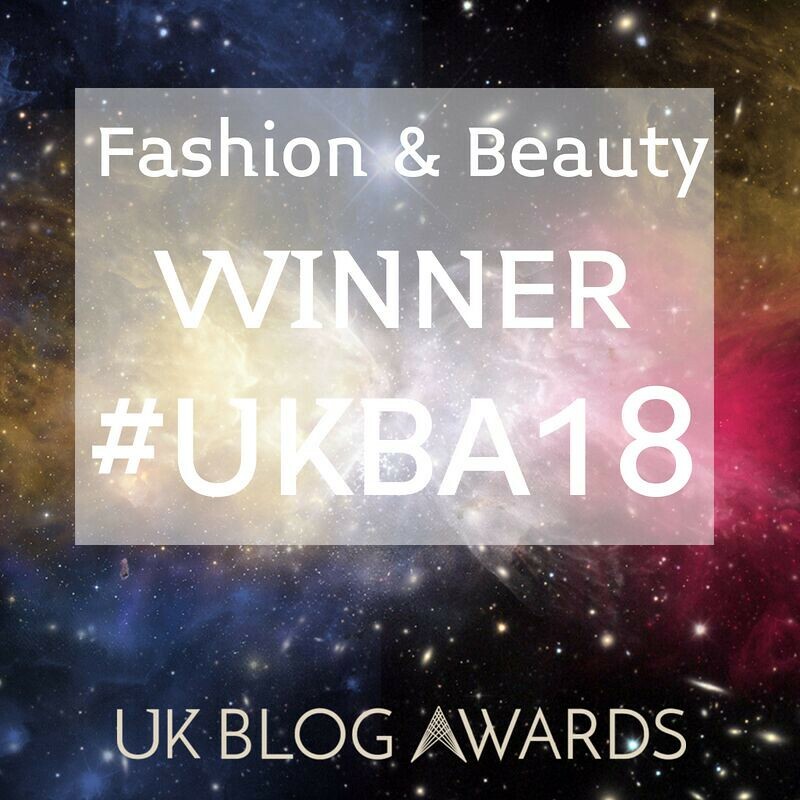 And finally I’ll apologise now: I bought the gorgeous floral clutch at the end of the summer last year (also Asos) and it’s no longer available… this was the first time I’ve ever used it – a bit of a “Finally!” moment. There is a SS15 version in slightly different colours which is no less pretty. P.S. Like this outfit? You might also like my post How to Make Florals Modern & Edgy from last spring! 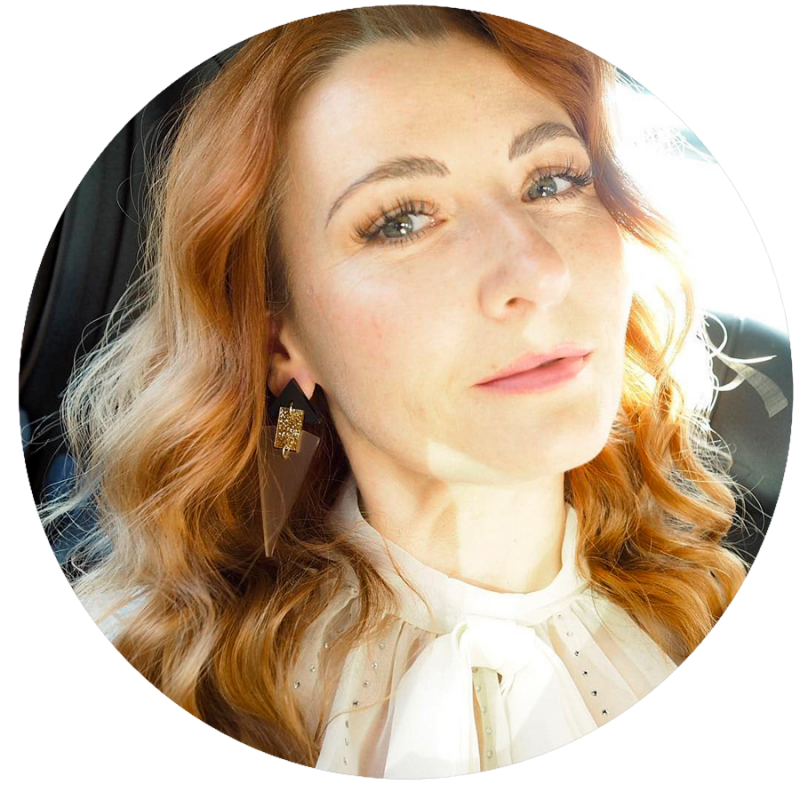 I have written this post in collaboration with Joules. All content is original, however, and opinions are my own and 100% honest. 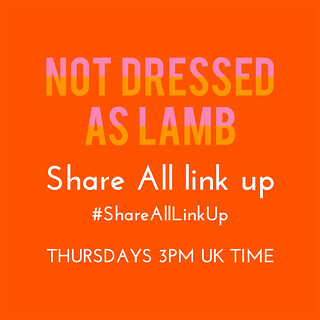 Previous Post Quick Opinion Poll | Hair and Make Up Video Tutorials for the Over 40s? Love the pink look, and the clutch is fantastic! This pink on pink is not easy to pull off but you did it beautifully! Sometimes a slight mismatch of color is what makes an outfit! I am absolutely digging these pinks and you look perfect for work or play! Love the beautiful details in the shoes and the clutch, adds such a fun quotient to the outfit as such. The yellow top and that adorable clutch brakes up the monochromatic look nicely. This is such a sharp, sophisticated look with the right amount of softness and feminine to it. Sometimes I love matching all the things I find in the same color in one outfit. Monochrome from head to toe hehe.. I find it really fun. You look so elegant and modern with this look .. The accessories you picked are driving me crazy. Catherine you look positively perfect in this outfit! 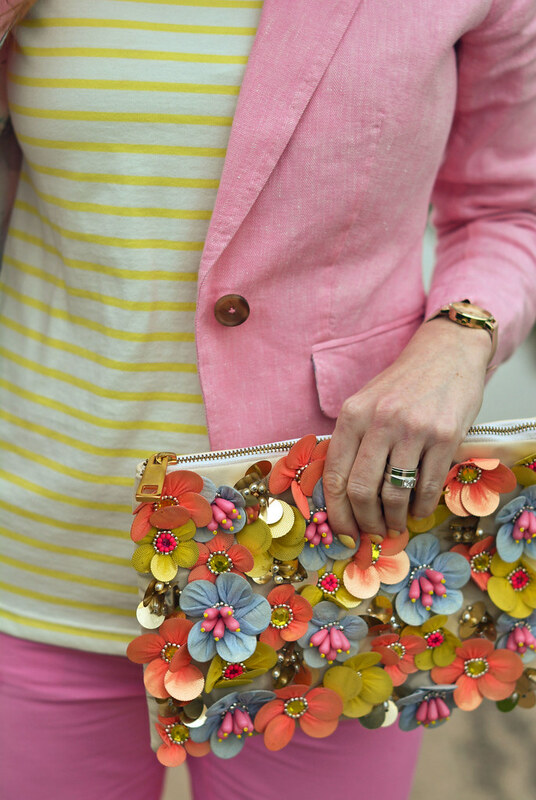 The POP of pastels and color is perfect for Easter (not to mention Hubby's birthday — Happy Birthday!!) but the bag is the most brilliant edition to this outfit. There's something about the way it's various colors pick up and compliment (without matching) the rest of the outfit in a way that just WORKS. Absolutely brilliant — as always! 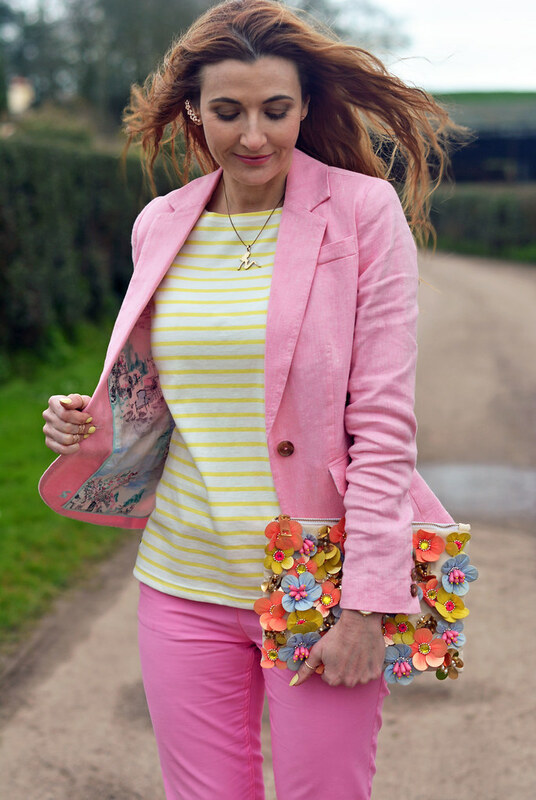 Haha I've just looked at the photos again… the bag has pink and yellow flowers in it. I think I'm going mad…!!!!!!! I love this outfit.It looks stunning. I am always scared to wear pink. You made me want to wear pink now. That outfit is so cute, I love the clutch. I don't think I own enough pink to do a head to toe outfit in it, haha. I have gone head to toe in mint green before. Your outfit is gorgeous! I've had a pink tweed suit made (Moschino style) but I haven't worn it yet…Maybe after seeing your post I will pluck up my courage 🙂 Thank you! I think the slight variation of the jacket pink and the jeans pink gives it a bit of a youthful twist. 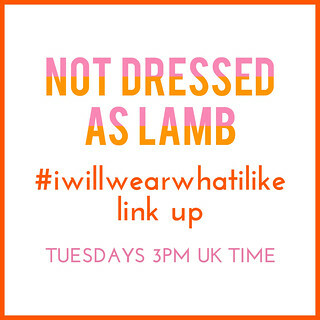 Nothing lamb-ish though! If I didn't have feet like Cinderella's evil sisters I would be getting those gorgeous, glittery shoes! Tine thank you so much for such a wonderful comment!!!! Firstly – your decor sounds amazing… pink and yellow in the house, wow! Secondly, you sound like a woman after my own heart when it comes to colour. And glitter too! And thank you SO much for the comments about the blog generally, I really appreciate them. I was really amazed (and proud) to be featured on WWW, especially when the list was so small, I was in great company. At first I got a bit of a shock when I saw the first picture but it grew on me very fast. It is not an outfit for the shy ones, but you won't have any problems with it. I went out of my way to wear an Easter outfit too. But less cold as yours. Those shoes are gorgeous, I would buy them immediately but at Easter with bare feet?? Brrrr… Cold. This is what I was wearing, including a sticker that said : Happy Egg (it ryhms in Dutch). You and the bare feet thing really makes me laugh, Greetje!! Around this time we saw girls in shorts and flip flops – now that really is crazy, it wasn't that warm!!! You did such a great job with this monochromatic look. I have worn an all blue outfit and it didn't feel too bad, I think the key is to break it up like you did here with the different shades of pink. I am wearing a monochromatic blue look today on the blog if you want to stop by to see. These glittery embellished slingbacks are everything! I remember reading your comment on Sylvia's blog!! Mine was that I could never wear this particular shape because they squish my toes so 🙂 I shall live vicariously through you, Catherine. And I'd do red. I love red. Unapologetically flamboyant red. I forgot to add that you look positively charming. love everything about this outfit! I also like the fact that the pants and the suit are not the same hue. I had a similar pant suit from Zara (bought it more than 10 years ago), but wearing it all together was too pink for me (and I love pink)! As for the clutch…it's ok…I pinned it for inspiration and if I'm not to lazy (happens often, I might attempt a DIY one! Oh wow completely lusting over those shoes. Such beauties! So pretty! Perfect for Easter. I've shared this on my FB page as well. I'm scouting for a thrift store clutch so I can create a DIY version of this. Suzanne thank you – I've looked but can't seem to get onto your FB page (the link says the content is unavailable). I'd love to see the clutch if and when you get it done…!!!! What a lovely outfit! 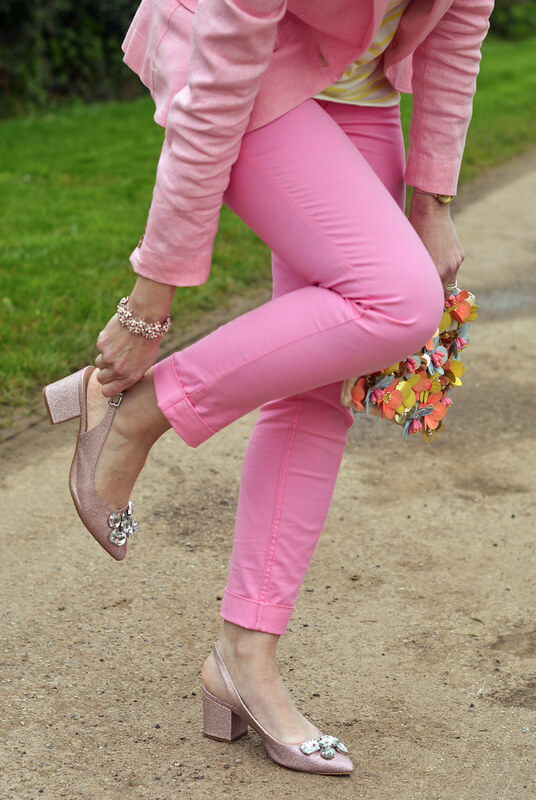 I love wearing pink and own more coloured jeans than the usual blue or black. The clutch is gorgeous too – what a lovely look for the Spring and Summer! Aww thanks Tracy – it was about time I broke out the brights!! I love this look. That blazer is so pretty. Thank you Stella – I love the contrast of tailored blazer in such a soft pretty pink!